*Music: Only for purchase of individual tracks & music pass on W indows 8.1; or music pass on Xbox One (Xbox Live Gold required). Taxes may apply. Internet access and a Microsoft account are required (connect time charges may apply).Xbox Live required to redeem on console. Original Xbox® excluded. Paid subscriptions required for some content. Except as required by law, cards cannot be redeemed or exchanged for cash and are not reloadable or refundable. Microsoft is not responsible if this card is lost, stolen, destroyed, or used without permission. 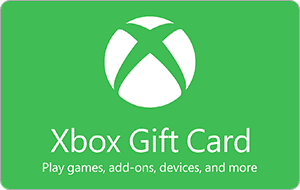 Subject to full terms and conditions at www.microsoft.com/en-US/giftcard, which may change without notice. Void where prohibited or restricted by law.